Are jobseekers under-qualified for the workplace? "Nearly one in ten people claiming JSA don't have basic English skills, and over one in ten don't have basic maths. And IT skills among jobseekers are even worse; nearly half don't have the basic email skills which are now essential for almost any job application." Labour has begun 2014 at a brisk pace, and following Ed Miliband's speech last week, today it was the turn of Shadow Work and Pensions Secretary Rachel Reeves to outline her plans for welfare reform in a widely-trailed speech at the IPPR think tank. Catching the headlines were her proposals to make welfare payments to jobseekers who don't meet basic standards of numeracy and literacy conditional upon them taking training in these skills. How big is the skills gap? Ms Reeves' claim about the proportion of jobseekers currently falling short in maths and English can be traced to the 2011 Skills for Life survey, by way of a parliamentary question. This shows that 7% of those claiming Jobseeker's Allowance (JSA) were classed as having 'entry level 1 or below' skills in literacy, while 12% of JSA claimants scored similarly in numeracy skills. Entry level 1 is described by the survey as equivalent to the attainment level expected of school children aged 5-7. Adults operating at this level may struggle to write short sentences or count. When it comes to IT skills however, the definition is slightly different. Here Ms Reeves appears to be referring to the 46% of JSA claimants that were found to have email skills equivalent to 'entry level 2 or below,' a slightly higher threshold expected of school children aged 7—9 at which adults are considered "able to use ICT to communicate, as well as enter and edit small amounts of information in ways that are fit for purpose and audience." 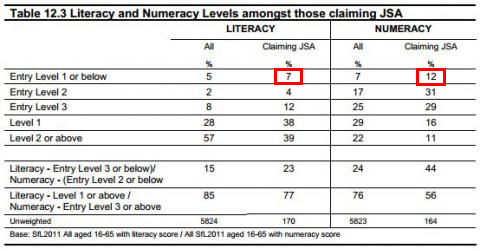 Interestingly, while just 11% of JSA claimants are judged to be entry level 2 or below in literacy, some 43% hit those levels in numeracy, just three per cent less than Ms Reeves' "even worse" news about IT skills. It is a bit of a stretch to describe the 7% of JSA claimants without basic literacy skills as "nearly one in 10" (it's actually less than one in 14), but Rachel Reeves' statistics on the proportion of jobseekers lacking entry level skills appear to reflect the findings of the most recent Skills for Life survey accurately. Homeless, poor, jobless and unhealthy: a portrait of Birmingham?